Thirteen was far from an unlucky number for Ramsey, whose Illinois Central College Cougars, after missing out on title trophies in 12 previous national tournament appearances - captured the 1991-1992 NJCAA Division II women's championship with an 89-72 victory over Lansing (Mich.) Community College late last March in Bismarck, N.D.
ICC defeated Kankakee 75-74 and Lackawanna (Pa.) 102-73 enroute to the title. The Cougars finished the season with a 29-7 record and a 10-game winning streak. A member of the Greater Peoria Sports Hall of Fame (Class of 1983) and Tri-County Sports Figure of the Year winner in 1979, Ramsey adds the big basketball trophy to a national softball championship. 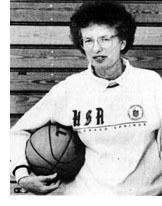 Her teams in 23 seasons at the two-year East Peoria school have recorded more than 500 victories in both sports. A former Pekin Lettes ( 401-90 career pitching record) star, Ramsey's playing and coaching accomplishments have resulted in her induction into six Halls of Fame. She has coached for the United States in four Pan American Games. One of a dozen Bradley basketball standouts to earn AII-American honors. Gene Melchiorre owns one of the most famous names in BU round ball history. An early star at Ft. Sheridan at the end of World War II, he teamed with another BU great, Billy Mann, with the two moving on to Bradley for the 1947-48 season. Over the next four seasons the Braves, coached first by A J. Robertson and then Forddy Anderson, won 119 games and lost just 22. It was the famed 1949-50 team that lost to CCNY in the title game of both the NIT and NCAA tournaments. 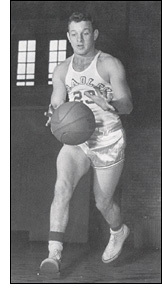 Standing just 5-foot-8, Melchiorre was both a top scorer (he still ranked ninth on the all-time BU list with 1,531 points at the time of his induction) and a brilliant passer. He shot .404 from the field, firing at a .436 clip his sophomore season. He scored 71 points in the 1949 NIT (when BU finished fourth) and 44 in three games in 1950. He was named to the Missouri Valley Conference first team three times and in his junior year made the all-NIT team and was a second team Helms and UPI All-American. After his final season he was an Associated Press, United Press International and Colliers Magazine first team All-American and selected by the magazine, Sports Album, as one of the two best offensive players in the country. Also a fine baseball player, Melchiorre played on the 1948 BU baseball team that was inducted into the Greater Peoria Sports Hall of Fame in 1996.